I love our iron skillet. This is our second iron skillet. The first skillet was a wedding present but Julie didn’t keep it. Too heavy, too hard to wash. The dishwasher did bad things to the seasoning. But now we know better. We wonder which of our grandchildren will want it when we are gone? It will still function as a non-stick surface or assault weapon in 100 years. From the factory the cooking surface was rough. 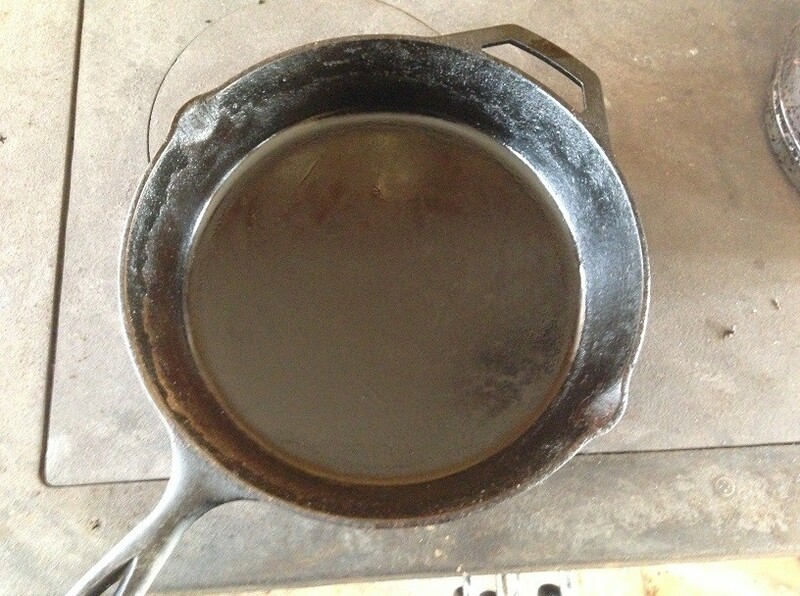 I sanded the skillet with wet or dry sandpaper wrapped around a block of wood and lubricated the sandpaper with a drop of cooking oil to work the day we bought it. I ran out of patience before it was entirely polished but it was close. 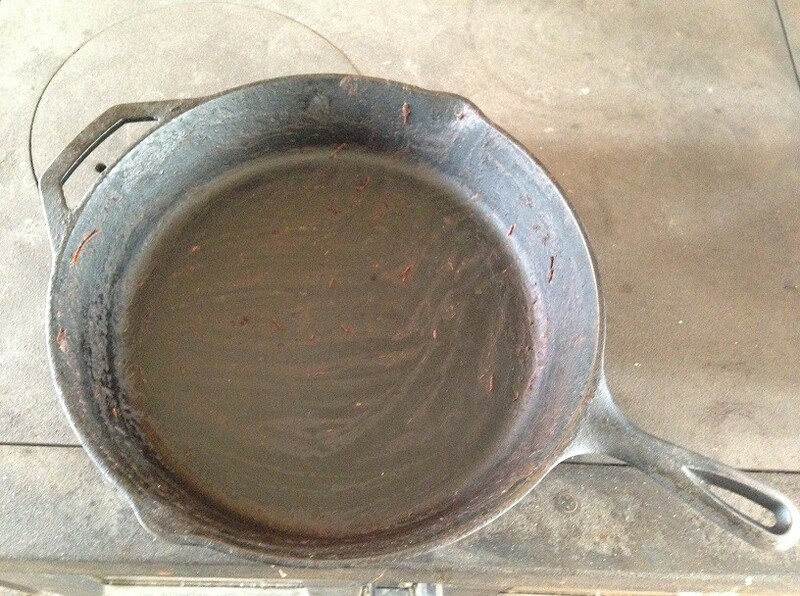 After that it was just years of scraping it clean with a metal spatula and cooking bacon grease into the surface. mmmm….bacon. We cook eggs every day. We have made apple pie in it. We cook potatoes. Skillet chili. Pancakes. We fry steaks. On and on and on it goes. How do we wash it? I don’t. I scrape it clean then cook a new layer of bacon grease in it, wiping it out with a paper towel. You really should use animal fat instead of vegetable oil as vegetable oil becomes sticky. Then we store it in the oven until next time. That’s it. I know, this won’t work in a commercial kitchen. If the skillet has dried chili in it from the last meal (…ahem!) things are a little different. I heat up the skillet then pour a little equally hot water into it. That boils off the bad stuff. Then I melt in a quarter-sized drop of bacon grease, scratch that around, wipe it out with a dry paper towel and call it good. BTW, if you use cold water in a hot skillet you will have a lump of cracked iron that is vaguely shaped like a skillet, not a skillet. The sides of the skillet are never polished like the bottom is. You don’t scrape and scratch and chisel away at the sides like you do the bottom. That’s just how it is. 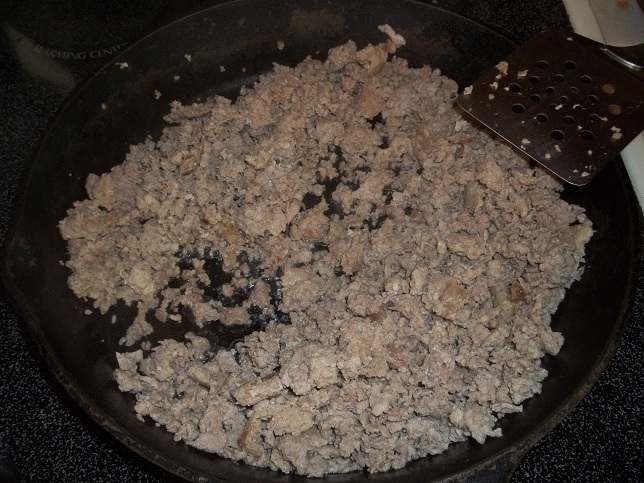 If you cook in your skillet for years and years and years the outside will accumulate burned grease coating that is almost impossible to get off. Almost impossible. If you want to be free of the accumulation, throw your skillet in an outdoor fire. When it cools down, give it a little scrub, add some bacon grease and get cookin’ again. One tip I think helps to keep the non-stick non-stick is to heat the skillet. I know, you people with your new-fangled teflon-coated aluminum skillets just pop the egg in and turn the burner on but these beauties, they need a little more time. Take a little bit to get the skillet warm before you pour in the egg. That instant sear on the bottom of the egg ensures it won’t stick. 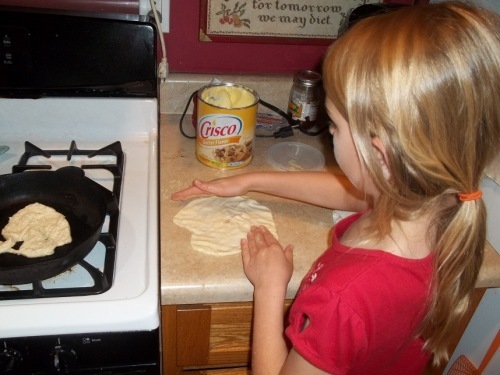 We usually put the skillet on the stove when we light the stove. By the time the fire is burning well, the skillet is warm enough to use. So we put those videos to work and lunch is in the oven. I’ll let you know how it tastes…if I can make myself waddle over to the keyboard. Oh, and we have rabbits for sale while they last. On the seventh day we rested, ate rabbit and it was good. We initially cooked it on a cookie sheet then, later, broiled it on a broiling pan. 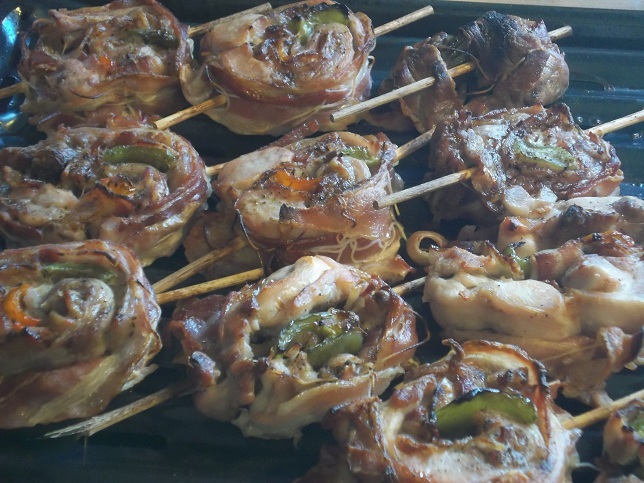 That’s the way to go if you want to avoid soggy bacon. The oldest boy went back for thirds. 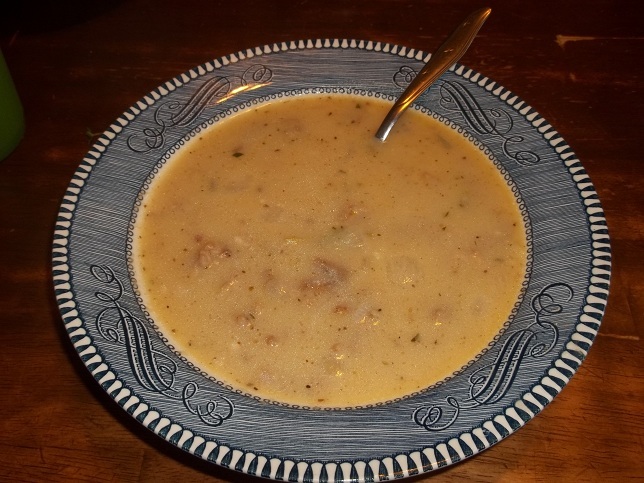 Cheesy Potato Soup is one of our family’s favorites. 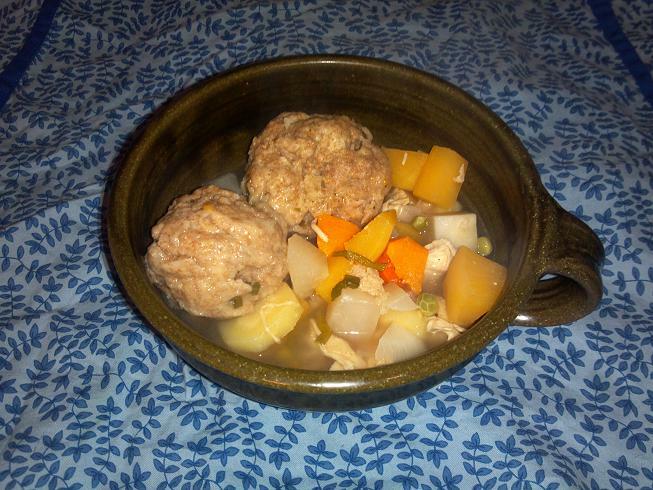 With our plethora of potatoes right now we have this soup at least once a week. 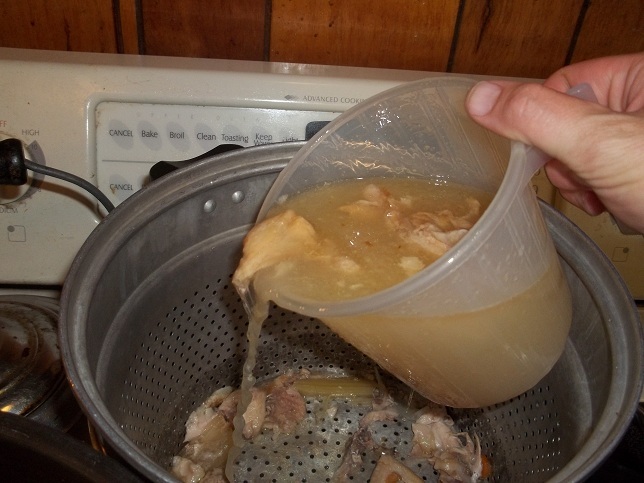 Start with homemade chicken broth made from Chism Heritage Farm Chicken backs and necks. While the broth is finishing up fry a pound of ground pork. Filter about 8 cups of the chicken broth. 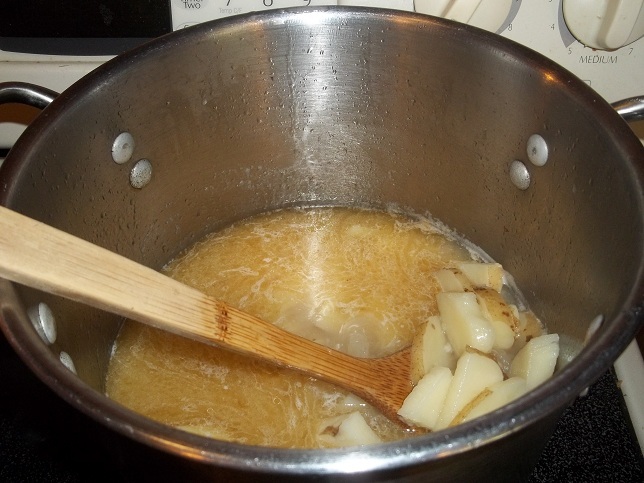 Use the broth to cook 8 large diced potatoes. While the potatoes are cooking, saute 1 onion and 1 pressed garlic clove. 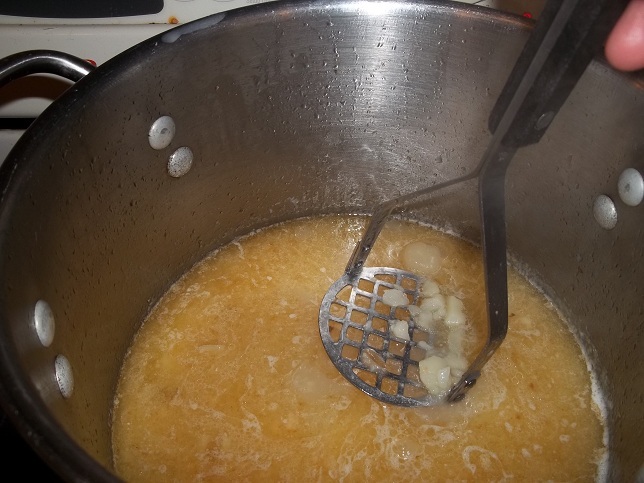 When the potatoes are tender (usually takes about 20 minutes), mash the potatoes. Add your spices. This time I used about a handful of herbs I pulled from our garden. 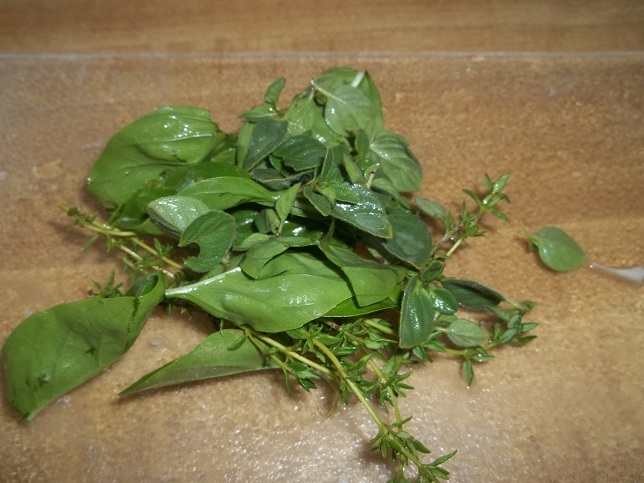 I chopped up the basil, oregano, and thyme and added it to the soup. 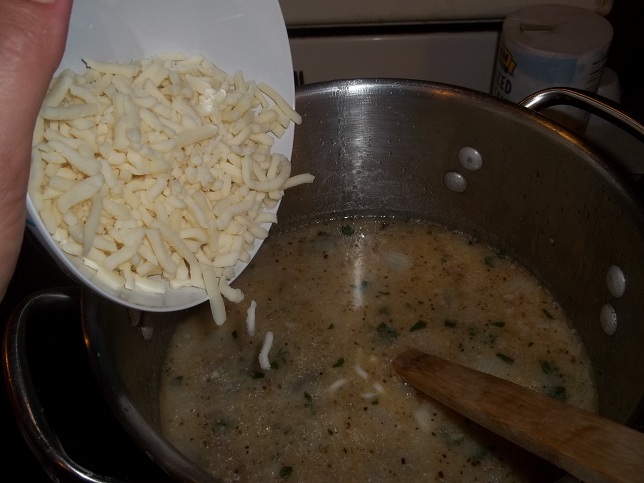 Next, add about 2 cups shredded mozzarella. and 2 cups shredded cheddar cheese. Pour in about 2 1/2 cups of milk. 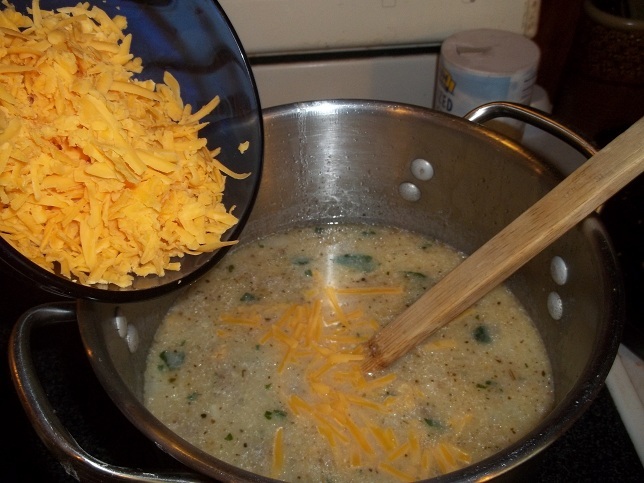 Stir soup consistently till cheese is melted. Add salt and pepper to taste. This makes a large batch of soup. 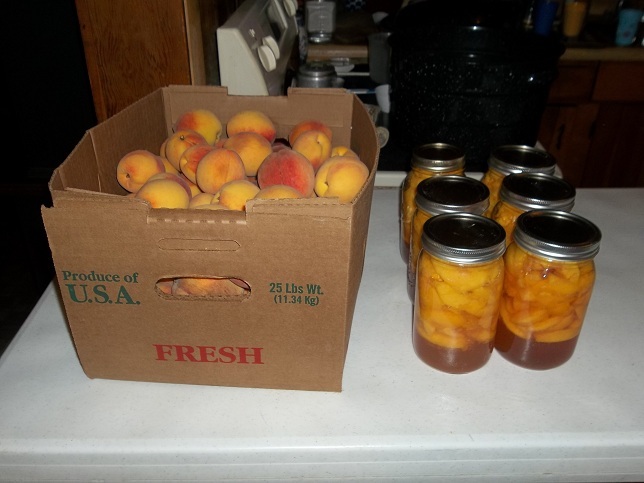 It fed my family of 6 last night, today for lunch and there is enough to send in Farm Steward’s lunch tomorrow. Eating healthy food doesn’t cost more money. It costs more time but gives you more time…time to live…past your 60’s. As food prices have fallen, health care costs have risen. Correlation does not equal causation but I think the two are linked. Here is my lovely bride with more to say on this topic. My reply was that in the long term eating cheap is very expensive – it costs you your health and medical care is only getting more expensive. As I thought about that conversion I wish I had taken it a different direction. I don’t believe it does cost more to eat healthy food, even in the short term. What are some of the items in your shopping cart this week? A bag of chips usually will cost $3/lb, Cheerios – $4/lb, Oreo’s – $5/lb, candy bars – $8/lb. Compare that to a Chism Heritage Pasture Raised Chicken – $3/lb or raw milk from grass feed dairy cows – .75c/lb. How much money do you spend on food that isn’t nurishing you? Cheap and easy food is not real and sustainable food. Just because you can chew it, swallow it, digest it and maybe even like it does not make it real food. Today there is no boxed cold cereal in my house. Breakfast is usually eggs and bacon, fruit salad with cottage cheese or oatmeal. My kids still love peanut butter and jelly but I make the bread and jelly. Dinner is usually a meat with vegetables but no bread. We do buy different food but eating healthy is not just about going to the store and buying different groceries or just shopping the perimeter. Healthy eating starts with a different approach to food. 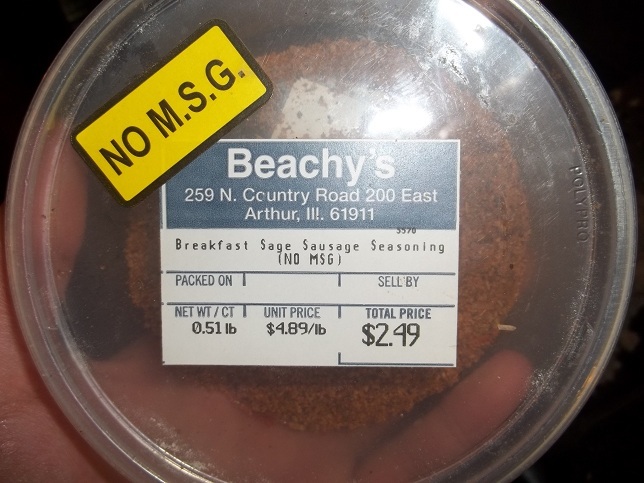 You don’t just buy pre-packaged food that is labeled “healthy”, you buy quality ingredients and cook them. There is no way around it, if you want to eat healthy you have to cook. If you don’t have the time or desire then you have to pay someone the cook for you. That sounds very expensive to me. The great thing about this approach is that it can lower your food budget while giving you more time with your family in the kitchen. Go to the library and read Nourishing Traditions The Cookbook that Challenges Politically Correct Nutrition and the Diet Dictocrats and Folks, This Ain’t Normal. Both books will give you a desire and a direction toward real food. Then get into your kitchen and help your farmer make the world better with just your plate and fork. Stop watching TV and cook something! I’m still learning, but I’m learning with my kids and it’s great. Old habits die hard but we can form better habits in ourselves and our children. Chime in below and let us know where you have found the most success in your healthy kitchen efforts. Here are a few sites we rely on to help us in our efforts. Expect this list to grow. Saute the onion and garlic in oil until fragrant. Add the lemon zest, pepper, and thyme and cook another 3 minutes until the onions are golden brown. Turn the heat to medium and add spinach and orzo. Cook for one minute. De-glaze pan with 1/2 C white wine. 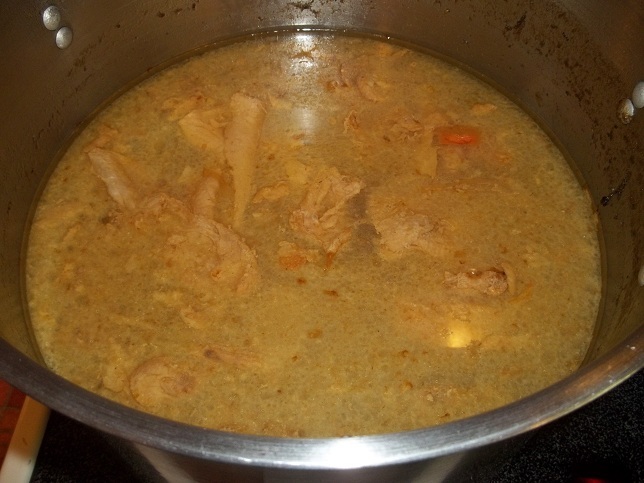 Add broth, chicken, and lemon juice. Bring to a simmer and cook for 12-15 minutes until orzo is barely tender. Whisk water and cornstarch together. 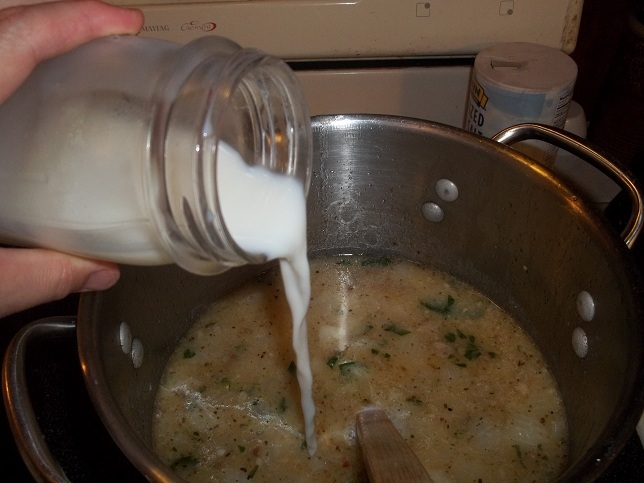 Bring the soup to a light boil and add cornstarch mixture. Let thicken for 3 minutes. 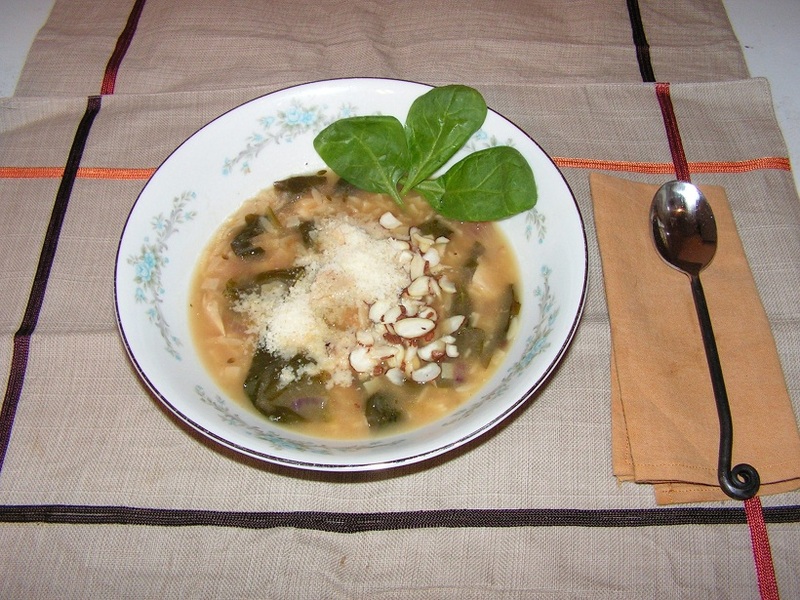 Garnish with Parmesan and Almonds. In a small bowl, whisk together the chopped mint, honey, and lime juice. Allow the mint-honey dressing to chill in the refrigerator for 15 minutes. Gently toss the prepared dressing with the cantaloupe and raspberries. Serve the salad immediately or store it in the refrigerator for up to 2 days. Set oven to broil. Mix oil, butter, garlic, salt and pepper in sauce pan. When hot, dip bread into oil on both sides. Dip one side of bread into Cheese and place cheese side up on cookie sheet. Broil for 8 minutes. Thank you for trying this out! 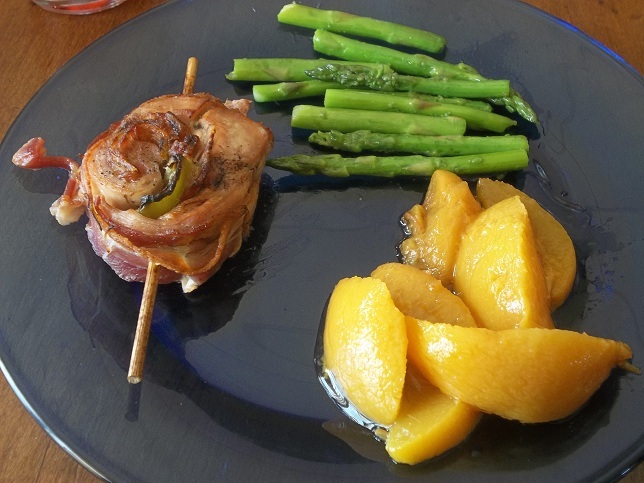 When summer reaches it’s peak, look out on this blog for a week of recipes using chicken and summer produce. As always, I appreciate feedback and am happy to answer any questions. Contact me at Jacquelyne@sew4cons.com and keep up with me at City Roots and Fruits. 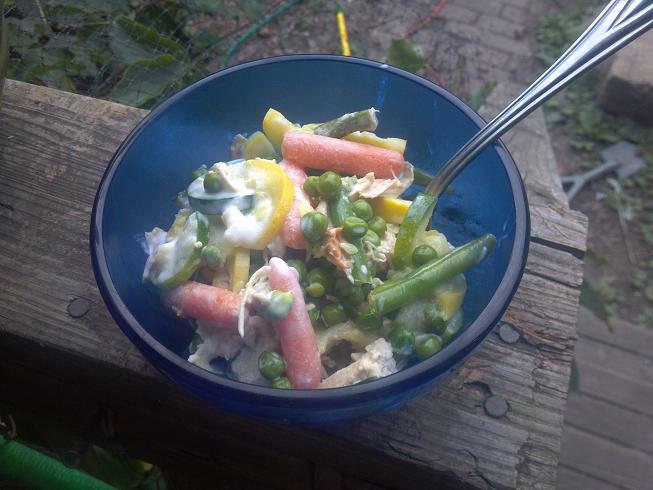 Here’s a vegetable heavy twist on an old favorite. I love root vegetables and springtime usually offers the opportunity to clean up the stores. 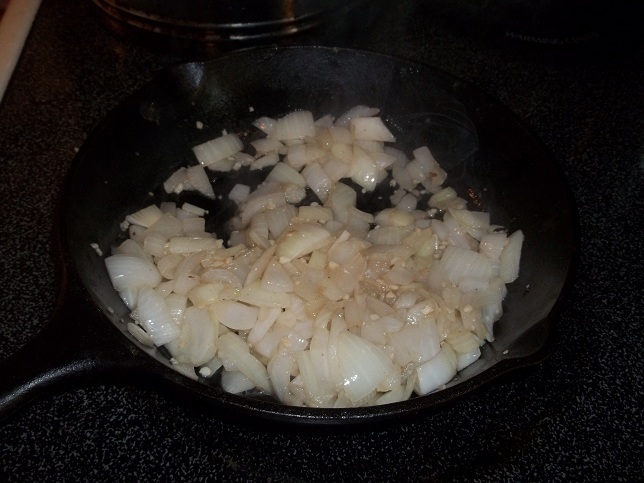 In dutch oven in 2 TBS oil, saute onions and garlic until golden brown. Add 2 C apple cider and deglaze pan. Cook for a couple of minutes. Add remaining ingredients holding peas and chicken for later. Bring to a boil, reduce heat and simmer for 15 minutes. Add peas and chicken. Mix all dry ingredients together. Add egg and milk and stir until forms a stiff dough. After stew has cooked for 15 minutes, drop dough on top in spoonfuls. Cover and cook 10-15 minutes more or until dumplings are light and spongy. Heat cream to 105 degrees F. Remove from heat and stir in buttermilk. Pour into small jar and cover loosely with plastic wrap, until thick but still pourable. Stir and taste every 6-8 hours. In 24 to 36 hours the creme fraiche should develop a slightly nutty sour taste. Once it does, refrigerate. May be stored up to 10 days. My husband once told me that he had never met anyone who at as many carbs as I do. So, no meal planning would be complete without pasta in my mind. Fry bacon until crispy and set aside to drain. In leftover bacon grease, fry chicken to reheat. Drain and put in bowl. Boil pasta according to directions. In a separate bowl, whisk together oil, Parmesan and lemon juice. Drain pasta and reserve one cup of cooking liquid. 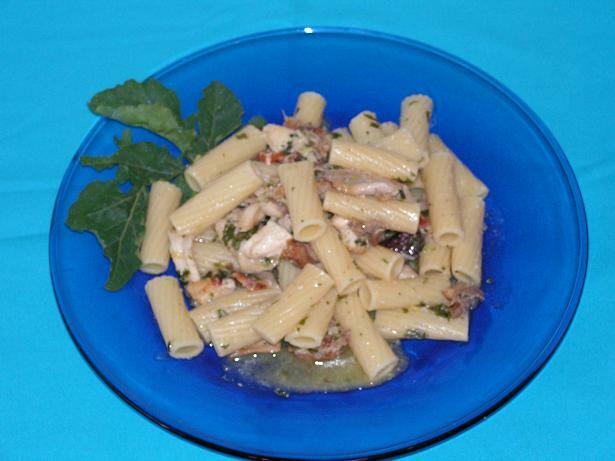 Put pasta in bowl and stir in dressing. 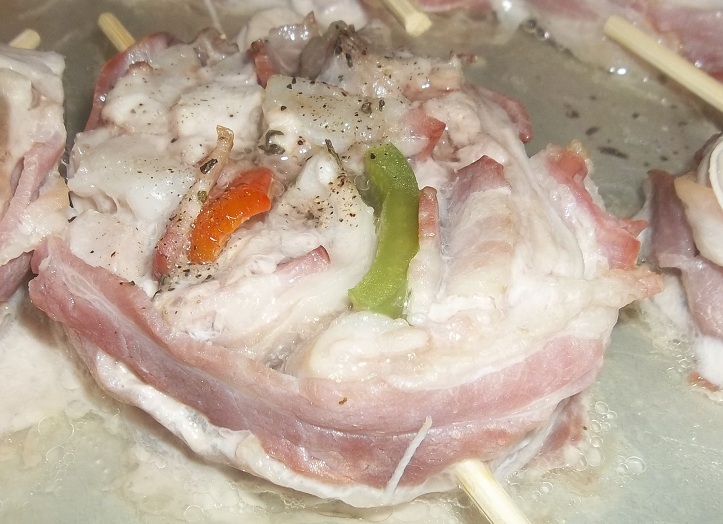 Slowly add cooking liquid until moistened. You may not need all the liquid. Chop bacon and add to pasta. Stir in remaining ingredients and serve. Serve with french bread and honey butter. Cream honey and butter together. Store in refrigerator until ready to use.